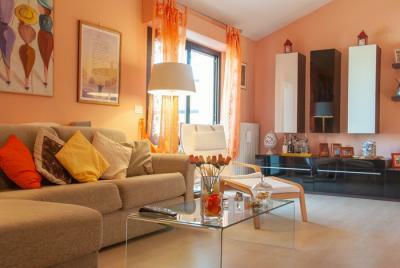 Pettinari immobiliare Real Estate is pleased to offer this penthouse in Porto Recanati, Conero Riviera, Marche Region. 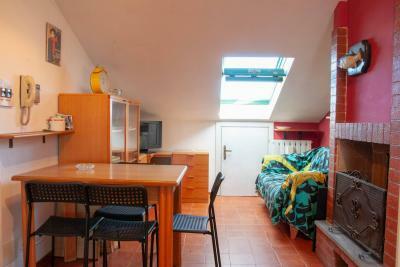 This brand new penthouse is part of a quite new residential quarter inside the historic town. The communal landscaped courtyard is the perfect place to relax meet other residents and enjoy the luxuriant planting and extensive seating and children playground. The property has breathtaking views of the sea and all around. 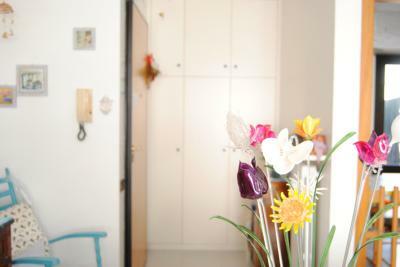 The apartment is stylish and thoughtfully designed with an abundance of natural light that fills each room. It would be hard to find a better location in Porto Recanati, near the beach, close to the town centre, near shops, schools, buses and walking distance from trains. Included in the cost of the apartment is a large, safe and secure garage in the underground, a rare and otherwise expensive addition. Also in this area are many safe and secure bike stores. It's now available this wonderful penthouse in a elegant landscape, it is about 116 sq.m., boasts a terrace on 3 sides of the home of about 120 sq.m. and a garage in the basement of about sq.m. 52. The House is in excellent condition, recently built, arched wooden beams, parquet flooring, air conditioning, independent heating and radiators, wooden window frames with double insulated glass and rolling shutters. The parquet and wooden beams make the home warm and welcoming. The entrance leads to a large comfy living room connected with the spacious kitchen which can accommodate also all small appliances for daily use. The living room leads to the bedrooms where there are two double bedrooms, one single bedroom/study and two bathrooms both with shower (one with Jacuzzi). All rooms have access to the large terrace where you can organise dinners with the breathtaking background of the sea or let children play during the summer days. The property includes a garage in the basement of about sq.m. 52, so big that can be used not only as shelter for cars but also as storage, bike rooms and even boat shelter. Finally there are no architectural barriers, the basement is connected by lift to the upper floors, allowing you to get out of the car and reach the House without having to climb even a step. The penthouse is located on the fourth floor of a house built in the year 2000 with anti-seismic criteria, the exterior of the building is in brick. The condominium consists of some houses for residential use and other for tourist use, and boasts a Concierge service in addition to a communal playground where children will love to play, where you can let children play by checking them comfortably from the terrace. Your dreaming seaside home is waiting for you!